Yesterday, a co-worker brought cookies to work but I couldn't have one because she had added butterscotch chips to the recipe and it wsn't vegan. Ironically, she had started with a vegan recipe and made it not vegan. This was perfectly fine - I'm not much of a sweet-eater or a snacker, and if I do snack, it's usually on something like nuts or pretzels. I especially don't find sweets appealing in the morning. (Currently, I'm most likely to snack on pistachios.) However, the cookies were very interesting looking in a healthy kind of way, and in spite of their healthy appearance, they were receiving very positive feedback from everyone who was sampling them. Healthy cookies that people like? This was a recipe worth tracking down. I got the recipe from Jen, and traced the original to this Web site where they're called, "energizing linzer cookies." My version (based on ingredients on hand and personal preference) is below. I made 21 cookies, some with raspberry jam and some with chocolate chips. The chocolate chips didn't melt as I expected them to, but they tasted good. The raspberry filled cookies were much prettier and I preferred them. The cookies are sweet, but the jam I used, organic sugar-free raspberry jam from Trader Joes, was actually a bit tart, providing an unexpected but pleasant contrast. Unfortunately, I ate too many. Place oats, almonds and walnuts in a food processor and process until crumbly. Add flour and flax and pulse until mixed. Add oil, syrup and vanilla and pulse until mixed and dough forms. Form into balls (wet hands help) and place on a lightly oiled baking sheet. Press a depression into each cookie with your finger. Place some jam or chocolate chips into each depression. Bake at 350˚ for 14 minutes. P.S. I was much too stingy with the jam and chocolate chips because I was afraid they would bubble up and ooze over the sides. Next time I make these - and there will definitly be a next time - I'm going to load up that jam and stuff in those chips. Jen says I should fill up the jam and put chocolate chips around the edge. Maybe I will. Tonight was a normal cooking night for me which means no recipes to use or write, no solid plans, no clear idea what's in the refrigerator. I don't usually blog about my cooking when I can't present a recipe, but might as well blab on since I've already started. A look in the fridge revealed broccoli and bok choy. Bok choy is so easy to stir fry so of course I chose that. There was tofu, which I haven't had for a while. 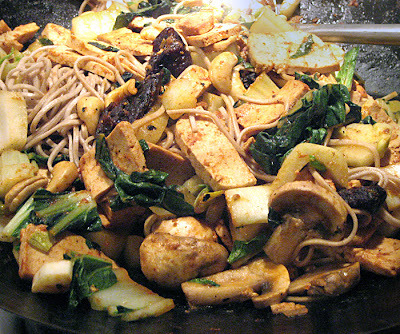 I thinly sliced some tofu and started sizzling it in the wok and started a pot of water boiling for soba. There was a container of leftover garlicky tamari-based sauce that we had made for bun salad so I tossed some of that on the tofu. There was leftover tomato paste so I added some of that with a little water. Threw in a couple of mushrooms. There was a recipe on Ricki's blog recently that had prunes and olives, and although I didn't have olives, I had a bag of prunes. I added a handful of prunes, cut in half, and also a handful of cashews, which I tend to add to everything. I cut up the bok choy and added that. By now the water was boiling and I cooked the soba and then added it to the wok. It looked pretty good so I photographed it and here it is on my plate. Delicious. Fast. Easy. Now, about those prunes. I read a while ago that prunes are high in calcium and may help build bones in women. It takes 7 to 10 prunes a day, which is a little beyond my capacity, but it seemed like a good idea to add them to my diet. Why not? They taste good and it can't hurt to add calcium. My husband does the food shopping and he keeps buying the prunes, not noticing if I've eaten any or not... so we usually have them in the house. I haven't been using them in cooking, but tonight could be the start. They really did taste great. It's been a rough week for various reasons I won't go into, and I've been eating weird combinations of leftovers instead of cooking. Finally, on Friday night, I needed to cook something. I'm the only one in the house right now (counting humans) as my husband is lecturing and attending a conference in Brazil, so cooking a lot of food was not really reasonable. After such a long and tiring week, I also needed something easy to prepare — and easy to clean up. I decided to make a creamy cauliflower and carrot soup in the pressure cooker. I used to make a similar soup for the kids when I was too tired or short on time to prepare a larger meal. I could give them a nourishing vegetable soup and maybe peanut butter or hummus sandwiches and they would be perfectly happy. In fact, on many occasions when I was searching for something to make for dinner, one of the kids would ask for this soup! It was a family favorite. (When I made it for the kids, I didn't load in the pepper.) I also use this method for similar soups such as broccoli, winter squash or carrot, and sometimes I add celeriac or parsnips to one of the vegetables to add depth to the flavor. Carrot and celeriac is a really good combination, and adding grated fresh ginger after the soup is blended makes it special. This soup, though simple to make, has a lush and velvety texture that belies its humble beginnings. And the color, a gorgeous shade of pale orange, is comfort for the eyes. You can intensify the flavor with grated fresh ginger, or other herbs and spices of your choice, but the plain version, with fresh dill, was just what I was looking for. I accompanied the soup with avocado spread on crackers. Place veggies and water in cooker and bring to pressure. Turn heat down a little and cook five minutes. Turn off heat and wait for pressure to come down. With an immersion blender, purée the soup in the pot. If you don't have an immersion blender, blend the soup in two batches in a regular blender. Blend until completely smooth and velvety. If too thick, thin with low-sodium vegetable stock. Add lemon, sweetener, salt and pepper. Check seasonings. Garnish generously with dill and serve. note: Substitute low-sodium vegetable broth for some or all of the water, for extra flavor. I always stock up on cranberries in the fall. I buy them at the farmers market and freeze them so I can make cranberry sauce or cranberry muffins the rest of the year. If you don't have any, you can usually find them in the frozen fruit section of the grocery store. This cranberry sauce usually shows up at most holiday dinners at our house. I've never had a recipe for it and it has kind of morphed over the years from strawberry-cranberry to apple-cranberry. I'm not sure when that happened, but I probably was out of strawberries one holiday and substituted apples and liked it better. I never measure the ingredients and usually give vague quantities when asked for a recipe, but this time I tried to keep track of what I was doing because I've been asked so many times for the recipe that I decided to make one. Here's what I think it is - more or less. The basic idea is to have approximately equal amounts of both fruits, so depending on the size of your apples, you may need more or less than five. If you cook the sauce with apple juice you will need less sweetener. I prefer my sauce on the tart side so I add very little sweetener - maybe 1/4 cup - to get the taste I like. I usually use apple juice but forgot to buy it so I used water this time, but it was still pretty sweet because of all the apples, so I think I added about 1/4 cup of agave syrup. Sometimes I use maple syrup and sometimes Sucanot or sorghum. Use your favorite in the amount you prefer. Sprinkle the agar agar into the 1/4 cup cold water and let soften while you wash and cut the apples. Combine the cranberries, apples, raisins, cinnamon stick and water or juice in a large pot. Bring to a boil, add the agar agar and stir it in. Reduce the heat and bubble gently for about 10 minutes - or until the cranberries open, the apples soften and the agar agar is dissolved. Place the kudzu or arrowroot (or cornstarch) in a cup and add just enough water to dissolve it. Add this to the sauce and bubble for a minute until the sauce clarifies. Add the sweetener of your choice in the amount you prefer. (Start with 1/4 cup for tangy sauce.) Add vanilla. Transfer to a bowl and cool. Every year for Passover, we have a wonderful seder with two other families of old friends. I've known the other two families since our kids were small, and our gatherings used to challenge the space available at the table. It usually involved setting up card table extensions and borrowing chairs to accommodate all the kids and an extra friend or three. Now that the kids are grown (the youngest will be off to college next year), the number of guests has dwindled, as children have moved elsewhere. This year we had the same old parents (that would be us) and three of the kids plus one "guest." There were 10 in all. The food, however, seemed to be of the same quantity—too much— as always! Because we had to work around kids' schedules this year, we had our seder on the second night instead of the first. That left me to experiment with vegan matzoh balls on the first night. I was too afraid to muck with tradition at the actual event. Saturday night I made vegan matzoh balls a la post punk kitchen, and Ken made not chicken soup from Mollie Katzen's "Still Life With Menu." Anyone who has experimented with vegan matzoh balls is probably familiar with both the sad little hard, rubbery ones and the disappearing ones that leave behind a pot full of murky water and nothing else. I'm relieved to say that Isa's recipe yielded 24 golf ball sized matzoh balls that were firm but tender, and tasted just like they should. (Even last night, the leftovers were delectable.) I actually preferred them to the classic ones. The soup was also excellent and filled with carrots and dill. On Saturday I also made our first asparagus spears of the season. Unfortunately, they weren't local, and not up to the standards we expect from our neighboring farms. But it's still too soon for local asparagus. This is, after all, Wisconsin. On Sunday, I cooked for our big seder with friends, and this year (most years, actually) I brought potato stuffing (three recipes), apple-cranberry sauce and a huge salad. The salad was the champagne salad I posted about recently. In addition to my contributions and the various ceremonial foods, there was soup, potato and mushroom casserole, stuffed cabbage, steamed broccoli and fruit salad. I was really taken with the stuffed cabbage made by Claire, but I won't post a recipe. Stuffed cabbage is just too time-consuming to be considered "easy vegan cooking." I really hope that Claire will make it again next year, but she likes to change things up, unlike me, a traditionalist at heart. Maybe she'll post a recipe and I'll link to it! I'm going to post my cranberry recipe soon — I promised Claire I would. And also the asparagus recipe. These have basically the same ingredients as the bun salad from the last post but the sauce should be thick and spicy. You use rice flour sheets to wrap the ingredients instead of putting them in a bowl. I recommend dipping them in a pan of warm water only long enough to make them flexible. If they get too wet they won't stick together and you'll have rolls like ours - falling apart and messy to eat! They will absorb enough moisture from the ingredients to completely soften the wrappers. We find the square wrappers seem to work better than the round ones. note: When we made the rolls above, we used homemade seitan instead of tofu. We made these again tonight substituting sautéed tempeh instead of seitan, savoy cabbage instead of bok choy and no bean sprouts since we didn't have any. The sauce was unmeasured amounts of agave syrup, Chinese red pepper, fresh lime juice, red chili paste and unsweetened organic ketchup. It may sound weird but it worked! Ever since our son took us to a Vietnamese restaurant last year in Seattle, my husband has been trying to re-create a bun salad like the one we had there. (the "u" is pronounced like "oo" in "book") They've been mostly in the "experimental-needs work" category. Tonight he made one that was delicious and he assures me it was easy. He found a recipe, tweaked it and made it vegan. It's a combination of both hot and cold components. He added some things and left others out and came up with a terrific meal. I hope you like it as much as we did. Actually, he left out a couple of crucial ingredients by accident. As we were munching away, I said, "isn't this supposed to have shredded romaine?" "Gasp," he replied. Oh well. It tasted great, and he'll add the lettuce - and the basil - next time. You can add it or not. Obviously it works both ways. Cook for two minutes in boiling water, drain and rinse. DO NOT OVERCOOK. Got that? These are served at room temperature, not hot. Toss the tamari with the tofu and let sit for five minutes. Stir fry the tofu in one tablespoon oil until browned. Add rest of oil to wok and stir fry the veggies until cooked the way you like them. Add cilantro at the end of cooking. Prepare the salad ingredients, noodles and sauce and arrange each in a separate bowl. Cook the stirfry last so it's hot. Put it in a bowl. At the table, each person has a bowl and assembles their own salad. Usually noodles on the bottom, followed by the raw salad ingredients, followed by the stir fry, followed by the sauce. This uses a lot of bowls, but is really quite simple to prepare, and looks beautiful laid out on the table. It's very colorful and appealing. I wish I had photographed the spread - but I was so hungry! Other than the fact that I'm vegan, I don't think of myself as a picky eater. But maybe I'm a little picky. Recently I spotted a beautifully arranged and photographed salad on veg lounge ("the most awesome salad in the world") that I thought would be a perfect accompaniment to the polenta and braised vegetables that we were planning to serve guests last night. As a plus, the dressing used a Trader Joe's product, orange muscat champagne vinegar, that I'd spotted long ago, but had never purchased. Now I had a good reason. So, I wrote a list of ingredients. Hmmm. Steamed beets. But I only eat beets to be polite, never by choice. The two exceptions to that are in borscht, if it has lots of lemon, and shredded raw if someone else has done the shredding. (I learned to eat raw shredded beetroot when we lived in Australia and it appeared heaped on lentil burgers and in the Australian classic, "salad sandwich.") I decided to substitute carrot. Hmmm. Candied pecans. There's something about the taste of sweetened nuts that I dislike in a big way. Sorry, Sangeeta, there can't be candied nuts of any kind. And truthfully, although I like nuts, I never used to eat them combined with other food unless ground up, as in almond cookies. I still never eat them in baked goods or ice cream, or chocolate. I've learned to enjoy them in savory dishes, but prefer them added whole. I've lately become fond of pistachios, so decided to use those in the salad instead of chopped almonds and candied pecans. I added crystallized ginger for a punch of zingy sweetness. The dressing was delicious, and fat-free as well - in the original version. I added a tablespoon of olive oil to mellow the sharpness of the lemon just a little. I recommend trying Sangeeta's version, it looks fabulous. But my version was also fantastic, so try it , too. The salad season approaches. Mix the dressing, pour over the salad, toss. You might want to reserve a few pistachios and ginger bits to throw over the top. Every once in a while I need pancakes. But does anyone really need another pancake recipe? No, I don't think so, but here's one anyway. I made these without looking at a recipe - no following directions to tax my bleary morning mind - and they are pretty basic. My husband and I both enjoyed the results. You could use maple syrup on your pancakes but I prefer blueberries. Heat juice and blueberries to boiling. Add arrowroot to water and stir to dissolve. Add to blueberries and bubble gently, briefly, until thickened. Turn off heat and add vanilla. I like this on the tart side but adding a tablespoon or two of maple syrup, agave nectar, or rice syrup will punch up the sweetness and enhance the flavor. If you like your topping thicker, use only 3/4 cup juice. Put the soymilk and vinegar into the blender to sit for a minute and curdle. Add the rest and buzz a few times. Scrape down the sides. Don't over-blend or the pancakes could be tough. We don't want that. Heat a non-stick griddle until drops of water hiss. When I was a pre-teen/early teen, my late father owned an Italian restaurant. Other than pizza and shrimp salad, I have no memory of what was on the menu. Those were the only things I ever ate there and pizza was the main thing. I really loved the pizza. When I discovered that my father was making big vats of pizza dough in the restaurant basement, I was shocked. No one had ever told me that HE was making it. I couldn't believe it. My father was not a cooking - cleaning - help - around - the - house kind of guy. He was a man who prided himself on never having changed a diaper for any of his three children. He went to work and came home and we kids were mostly supposed to not bother him. When I found out about the pizza dough I was beside myself. I couldn't stop pestering and begging him to make pizza at home. After a couple months of incessant nagging he finally agreed, and this was the start of pizza making at our house. He made the dough and it was my job to grate the cheese (in those days real cheese) and make the sauce. I was probably about 11 or 12 at the time but I still remember it perfectly. It was an uncooked sauce that doesn't sound good but made a delicious pizza. I put tomato paste into a bowl and thinned it with water until it would drop from a spoon. I added garlic salt and oregano and a little sugar until it tasted like pizza sauce. It had to be a little more seasoned than usual so it would be flavorful on the baked pie. Of course, now I prefer to have some yummy leftover tomato sauce on hand when I make pizza but if I don't...well... I'm not above opening a can of tomato paste and quickly making a sauce. I use granulated garlic or fresh smashed and minced garlic, chili powder and oregano. Maybe some dried onion flakes will be added or some hot pepper flakes. But a jar of Enrico's Pizza Sauce or Muir Glen organic pizza sauce are also reasonable alternatives to homemade. I still love pizza, and have posted a recipe before this one. It was made with a dough based on Peter Reinhart's mimimal-yeast, slow-rising recipes from "The Bread Baker's Apprentice," a book I love, love, love, and highly recommend to serious and aspiring bread bakers. The breads and pizzas I bake based on the recipe I've worked out for my bread machine (forgive me Mr. R), are stellar. The pizza is fast, but the breads, while not requiring much hands-on time, take all day to rise before I bake them on my stone. The pizza is the thin and crispy crust type and incredibly good. Here's another idea for a crust based on a fast and easy bread I've been experimenting with lately. It makes a softer, but delicious crust with little fuss - no bread machine needed. I used my variation of the recipe, but the original recipe and instructions are found here. To make pizza, you should let the dough rise once in the bowl, and then form the crust. I used a pizza pan for the crust because I thought the dough was too soft to get it easily onto the pizza stone, especially covered with all the toppings. Let the crust rise about a half-hour before adding the toppings. I used tomato sauce, Follow Your Heart Vegan Gourmet mozzarella, crimini mushrooms, broccoli, onions and sausage crumbles. I pre-heated the oven to 475 and baked the pizza for 3 minutes before turning the oven down to 350 and baking until done - about 20 minutes. Bake the pizza near the bottom of the oven for the best crust and check it for doneness before the whole baking time is up. The recipe makes two breads so I made one pizza and one bread. I really miss Seattle. While it wasn't particularly warm, and it rained a lot, at least it was clearly spring. The cherry trees were in full bloom and daffodils and other beautiful flowers were everywhere. Here in Madison, there is still snow on the ground, although I did spy some snow drops (the flowering variety) in the back yard. I must be thinking of spring because when I grabbed my lunch from the refrigerator this morning, I thought I saw a package of asparagus in there. I have a wonderful recipe for asparagus cooked with balsamic vinegar that I make every year to celebrate the coming of spring. It seemed a bit premature to be eating asparagus, but I was willing. By the time I got home, took the dog outside and did a bunch of chores, it was 7 p.m. I spent 15 minutes looking for my recipe before finally finding it. I went to get the asparagus and discovered it was actually a package of baby broccoli. Disappointed but unwilling to shift gears, I was ready to cook whatever with the asparagus recipe. There was also a package of small red, yellow and orange peppers so I cooked them too. Well, I'm not going to write the recipe here because it wasn't a particularly good way to prepare broccoli, and the recipe deserves asparagus. And I burned the cashews, which look kind of like grubs, don't you think? In my opinion the flavors didn't work well together and the vegetable wasn't tender enough - I think it needed to be steamed before being stir fried. The peppers tasted great, though. My son ate the leftovers the next day and thought they were good, but I'm holding out for asparagus. I don't think I've ever had to find something to eat at the Minneapolis airport, and I wasn't too optimistic about finding vegan food. But, we had lots of time to look around. After setting off the security alarm three times before realizing that I had a cell phone in my back pocket, they finally let me through security. Frazzled, I wasn't too hungry, but Ken and Jordan were. As we were walking towards our gate, I spied a French Meadow Bakery Café and went to investigate. I used to purchase French Meadow sourdough bread and I knew the company had a popular café in Minneapolis. There were a number of choices for vegans and the food I chose was fresh and organic. I was feeling kind of well-fed after our vacation, if you know what I mean, so I opted for a spa salad to eat later. It was packed with fresh raw salad stuff and a too-generous slab of grilled tofu. It came with avocado dressing on the side. Ken and Jordan chose grilled tempeh reubens which took kind of a long time to arrive but which they both really enjoyed. Looked a bit greasy to me, but oh well. There were lots of salad greens for balance!